BBC NEWS | UK | UK Politics | Half full or half empty? In the end, after all the talks, the lobbying and the haggling over words, the G8 summit at Gleneagles came down to a battle of metaphors. Just how best should the work over the last three days at this Scottish golf course and equestrian centre be characterised? Was, asked some, the cup half full or half empty? 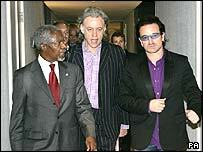 Most agreed it was a good deal on aid - $25 billion more for Africa by 2010. Debt was not bad - some 14 African countries will not have to pay any of the billions of debt they owe the big international banks like the International Monetary Fund. And on trade, well, the summit agreed that African countries should no longer be forced to liberalise their markets in return for aid. "A mountain has been climbed," declared the U2 rock star Bono, who alongside his comrade in alms Bob Geldof, has been lurking on the fringes of this summit. But, he said, and it was a big "but" that was echoed by the army of charity workers and aid lobbyists here. Not wanting to sound too negative, he continued: "But let's also look down on the valley from where we've come." So what of the "but" and those "higher peaks"? The extra $25bn won't come on stream until 2010 - not soon enough, say some. The debt relief doesn't go far enough, say others - the write-offs should be bigger and more widespread. And as for trade, even the prime minister conceded that he had failed to make progress. He had wanted to fix a date to scrap the damaging European and American agricultural subsidies that flood African markets with cheap foreign goods. Mr Blair said he wanted to set a date of 2010 and expected it would be agreed at trade talks in Hong Kong later this year. Well, perhaps. Dr Kumi Naidoo, from the anti-poverty lobby group G-Cap, said after "the roar" produced by Live 8, the G8 had uttered "a whisper". In private, the non-governmental organisations were more disappointed. They had urged Geldof to say: "The people have spoken, but the politicians have not listened." But Geldof would not play ball. This, he said, had been the most important summit there had ever been for Africa. The prime minister agreed: "We won't make poverty history, but we have shown how it can be done and show the political will to do it." As for the other main item on the agenda, climate change, there was widespread pessimism. The prime minister insisted there had been greater agreement than before that humans are to blame for global warming, and that there was now a "pathway to a new dialogue". But the experts said the Americans had not made any concessions on the science of climate change, and the promises of new money to invest in non-carbon technologies had failed to appear. Mr Blair conceded modestly: "What this is is the possibility of re-establishing a consensus." But together with Africa, he insisted: "Politics is about getting things done step by step, this is progress, and we should be proud of it." The bottom line is this. On Africa, the G8 made progress that, if implemented, will be substantive and meaningful, particularly on the issues of aid and debt relief. On trade, the buck was passed onto the trade talks in Hong Kong later this year. The least progress was made on combating climate change, but then there wasn't a big concert in London for that, was there?